Deaths caused by falsified medicines containing dangerous and illegal substances are on an alarming rise in the United States. Fight the Fakes partner The Partnership for Safe Medicines is making great efforts to tackle this epidemic-like matter. On 7 June 2018, during the 2018 Interchange conference, they joined forces with another Fight the Fakes partner, the National Association of Boards of Pharmacy (NABP) and the National Association of Drug Diversion Investigators (NADDI). Together they formed the Fentanyl Council, a body that raises awareness to the wider public and supports law enforcement to bring justice to those responsible. The event was also marked by the stories of three mothers, who had lost loved ones because of falsified medicines. Fight the Fakes and the Partnership for Safe Medicines want to share the stories of Carrie Luther, Lisa Hicks, and Jennifer Hodge to raise awareness about the individual consequences of falsified medicines and to speak up against them, together. Carrie Luther shared the story of her son, Tosh, a 29-year-old with a bright future ahead of him, whose life was cut short by a fake pill, pressed into the shape of a legitimate Xanax. Tosh was extremely close to his family, often getting together for dinners and playing games with his mom, dad, siblings, and nieces, who adored him. Those who knew him described him as a genuine person who cared about what they had to say and always offered a smile and a kind word. Tosh had developed hives, which caused insomnia, so Tosh took part of a pill to help him sleep. However, even though the pill looked like a regular prescription medicine, it was a counterfeit that contained a high quantity of the powerful opioid fentanyl. Traffickers in Mexico, Canada and the US are using illegally imported fentanyl and pill presses to create counterfeit medications. Tosh never willingly took a pill made of fentanyl but was deceived by falsified medicines. By paying tribute to Tosh’s life and telling his story, his mother Carrie is saving lives through raising awareness of the dangers of falsified prescription medicines. Lisa Hicks lost her only son Joe Patterson to fake medicines. Joe was very careful about his health and his physical fitness and was striving to become a personal trainer. Moreover, Joe’s girlfriend was expecting their baby and he was thrilled to become a father. The day Joe tragically passed away, he went to the gym but pulled a muscle during an exercise and asked a friend for a pain reliever. Unbeknownst to him, his friend provided him with what looked like prescription oxycodone, but which in fact was a counterfeit pill that contained a high dose of fentanyl. Joe passed away less than 24 hours after taking the pill from an overdose of fentanyl. While his mother continues to contemplate about what could have been done to stop this from happening, nobody could expect that falsified pills would become so widespread and deadly. To prevent other patients falling victim to this threat, Lisa Hicks continues to speak up against fake meds and raise awareness about her son’s tragedy. Jennifer Hodge’s son Robbie struggled with anxiety issues but with time and treatment, he learned to cope with his anxiety better. As a young adult, Robbie helped his mother launch a project that would enable people to pay for needed drug treatment programs. Their non-profit gained momentum, and Jennifer and Robbie continued to work for its success.. Tragically, after a long Thanksgiving holiday weekend, Robbie suffered from an anxiety attack and tried to treat it with Xanax he got from a friend. The pill he took looked like prescription Alprazolam but contained a fatal dose of fentanyl. Having dedicated her efforts to fight drugs, Jennifer Hodge then experienced the loss of her son by drug-laced falsified medication. However, she continues to fight and tells her story to increase awareness about the invisible and dangerous threat of falsified medicines. These deeply-upsetting stories that the three mothers shared during the 2018 Interchange conference have two things in common: first, the medicines that caused the deaths of their sons were falsified and contained very dangerous substances, disguised in prescription medicines. And second, the three mothers affected by tragedies are speaking up against falsified medicines and are highlighting the dangers to public health. 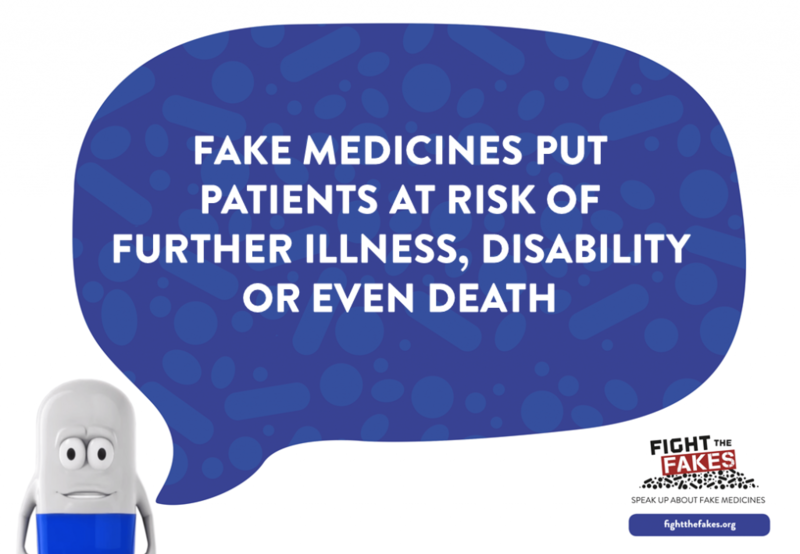 To support them in their efforts, Fight the Fakes wants to amplify their voices to prevent future parents, siblings and people to fall victim to falsified medicines. You can watch the full 2018 Partnership for Safe Medicines Interchange conference in the video below. The testimonials start at 1:17:00. You can also find out more about Tosh Ackerman and Joe Patterson on the Partnership for Safe Medicine’s website, where Lisa Hicks has also written an op-ed about her experiences.